Whenever possible, I like to use natural sweeteners–pure maple syrup being a favorite–and try to limit overall sugars in general. I do have a sweet tooth, so it is an ongoing challenge! With wider access to a broad range of sweeteners, I have started to dabble with options such as coconut sugar and stevia and have received more questions from readers regarding the various options. When I recently read a succinct and informative guide to unrefined sweeteners written by Amber Shea Crawley, a classically trained chef specializing in healthful, plant-rich food, I asked if she would be willing to share her knowledge with my readers. I was thrilled when she said she would love to. Not only is the following an excellent overview of the various options available to us, it provides a resource to which you may return in the future if you decide, for example, that you would like to replace granulated sugar with something else in your favorite cookie recipe. 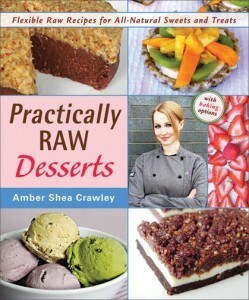 Following Amber’s writeup is a decadent yet wholesome treat she enjoys which happens to be a recipe from her cookbook, Practically Raw Desserts. More information about where you can find Amber and her book follow the recipe. So without further adieu, I’d like you to meet Amber! ■ Coconut nectar: My #1 liquid sweetener of choice these days is the ambrosial amber syrup known as coconut nectar. Not only is it utterly scrumptious, it’s also low on the glycemic index and chock-full of amino acids, essential minerals, and B vitamins. I consider it the ideal liquid sweetener, but agave nectar is always a suitable substitute. ■ Agave nectar: It’s no secret that agave nectar has come under fire in recent years for its high fructose content and questionable level of processing. That said, it’s much more widely available (and affordable) than coconut nectar, so do not hesitate to substitute it in my desserts; many of my recipe testers for this book did just that. Though I’ve largely abandoned its use in my own kitchen, I do still keep a bottle of organic, raw agave nectar on hand for when I need a sweetener that’s thinner than coconut nectar but slightly more viscous than maple syrup. ■ Maple syrup: Since maple syrup is the boiled sap of maple trees, it is not raw, but I use it freely in my raw dessert recipes. It’s minimally processed and actually contains respectable amounts of minerals like manganese and zinc. Plus, its distinct taste is simply irreplaceable. Always buy 100% pure maple syrup (never “pancake syrup”), and stick with Grade B, which has the most robust flavor. ■ Date syrup: Consisting of nothing but puréed dates and water, homemade date syrup contains all the fiber and potassium of whole dates, making it a true whole-foods sweetener. It’s only about two-thirds as sweet as other liquid sweeteners, so it’s not a simple 1-to-1 substitution, but in my cookbooks, I always let you know when you can sub it in for another sweetener and how much of it to add. ■ Coconut palm sugar: Whether you call it coconut sugar, palm sugar, coconut crystals, or jaggery, this is one fantastic granulated sweetener. Coconut palm sugar is my very favorite granulated sweetener, with its low glycemic index, high mineral and B-vitamin content, and marvelous flavor (like brown sugar with a caramel edge—divine!). You can always substitute Sucanat or date sugar if you prefer. ■ Dates: Luscious, potassium-packed dates are an all-purpose staple in raw desserts, and they are my favorite whole-food sweetener. Their sticky texture can bind together brownies, bars, pie crusts, energy balls, and more, or they can be blended into fillings and purées. Semi-dry Deglet Noor dates are the most common and inexpensive variety, and they often come pre-pitted. Medjool dates are the softest, sweetest variety, and they tend to be sold with their pits still in. Always remove the pits from your dates before using them! Many other delicious dates exist (Barhi, Halawi, Khadrawi, and honey dates are some other well-known varieties)—use whichever one you love best! ■ Raisins: Dark (also called Thompson or Flame) raisins and golden (including Sultana and Hunza) raisins are not only excellent ingredients in their own right, they can also make an affordable and readily-available substitute for dates. When subbing raisins for pitted dates, make sure your raisins are nice and soft; dried-out ones won’t work nearly as well. ■ Stevia: The only all-natural, calorie-free sugar substitute currently available is Stevia rebaudiana, or stevia leaf. Up to 300 times sweeter than sugar, stevia leaf extract can be useful for anyone desiring a low-glycemic, carbohydrate-free alternative to natural sugars, as it has no impact on blood sugar levels. Its intense sweetness and bitter aftertaste can be a turn-off for some, but once my taste buds adjusted, I became a huge fan. When sweetening to taste with stevia, always start by adding only the smallest amount possible—literally a few droplets of liquid stevia or a tiny pinch of the powdered form—and tasting for sweetness before adding any more. ■ Others: There are a plethora of other unrefined sugars out there to check out (some raw and some not). You might explore options like local honey, yacon syrup, brown rice syrup, sorghum syrup, molasses, Sucanat, date sugar, maple sugar, lucuma powder, evaporated cane juice, or even sugar-free sweeteners like xylitol or erythritol. And if all you have on hand is ordinary white or brown sugar, I don’t mind one bit if you use it in my recipes! You’ll still be making a homemade sweet treat, which is ten times better for you than buying one at the store. For some of you, avocado pudding is probably old news, but for others of you, this might be the beginning of a beautiful friendship. Avocado creates a silken texture that you have to taste to believe (and I promise you won’t notice any avocado flavor). Unsweetened cocoa powder or carob powder can be used instead of cacao powder, and 1/3 cup maple syrup or coconut nectar can be used in place of dates, just reduce or omit the water. Combine the avocados, water, vanilla, and salt in a high- speed blender or a food processor. If you don’t have a high-speed blender, use the food processor here, not a conventional blender. Blend until smooth and combined, using the tamper if necessary with the high-speed blender. Add the dates and blend again until well-combined and smooth. You will need to use the tamper here with the blender. Add the cacao powder, put on the lid (so you don’t get dusted in chocolate! ), and blend again until smooth. Taste for sweetness and add stevia, if desired. Serve immediately. 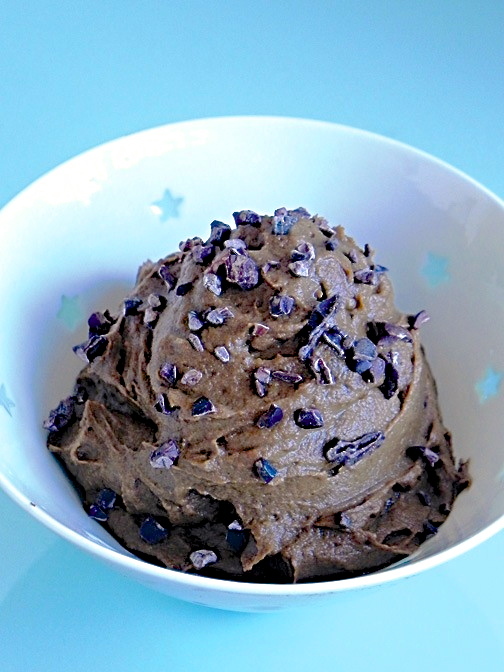 Store leftover mousse in an airtight container in the refrigerator for up to 1 day. 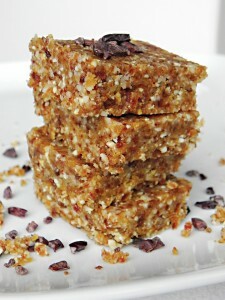 From Practically Raw Desserts by Amber Shea Crawley. ©2013 Amber Shea Crawley. Used by permission from Vegan Heritage Press. Author photo by Stephen Melvin. 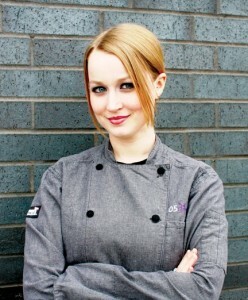 Amber Shea Crawley is a classically trained chef, linguist, and writer in Kansas City, Missouri. 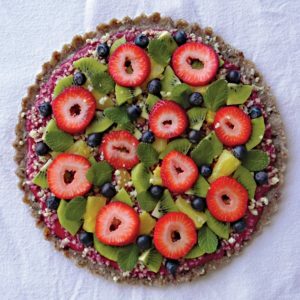 Specializing in healthful, plant-rich food, she is the author of the vegan cookbooks Practically Raw and Practically Raw Desserts as well as the ebook The REAL FOOD Cleanse. Amber blogs at www.chefambershea.com. I’m so glad to see that everyone is finally coming around on agave nectar… unless you are diabetic it’s really not a great choice. My favorites are date syrup (recently started making this… where has this idea been all my baking life?) and maple syrup. I could drink maple syrup by the glassful, so, so yummy! I could drink maple syrup by the glass, too…love it! Thanks for the comment, Alex!